We are pleased to announce our special offer of hops for home brewing in 1Kg blocks. These blocks are aimed at the keen home brewer or they could be shared within a brewing group. I understand that home brewers often want to buy larger quantities to benefit from a more favourable pricing structure. Hence this special offer which is for a trial period only to see how this idea is received. 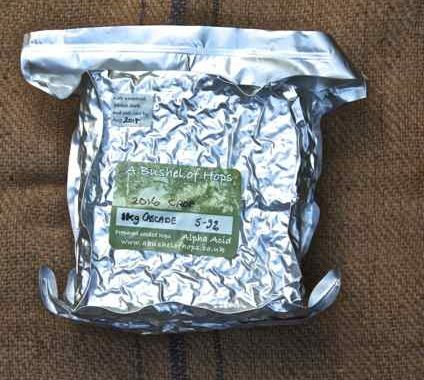 Please note – with this special offer of hops for home brewing in 1Kg blocks, each block can only be ordered individually and posted singly. I reserve the right to withdraw this offer if I need to preserve 100gm stocks of any variety for our smaller home brewing customers. Hop picking is over for another year, the crop has been harvested and dried which means A Bushel of Hop’s Shop is now open for this season’s hops. My hops are not bought in, they are grown and packaged on the farm. Packaging begins as soon as hop picking is finished to get the freshest, ‘hop-garden to brew-pot’, hops possible for the home brewer. After listening to brewers, the other change instigated this year is our uprated packaging. 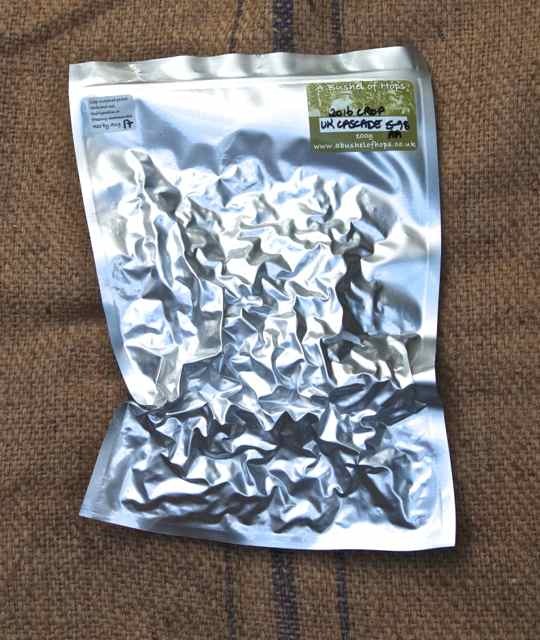 Even though I only sell hops from the current season, this new 100% foil packaging allows hops to remain even more freshly vacuum packed as it prevents all ingress of light and oxygen. It is still important that packets are stored in a cool place or they can be frozen. I also understand that some home brewers believe they sometimes get the raw end of the deal where hops are concerned when compared to the larger breweries. My primary aim at A Bushel of Hops is to grow and supply the home brewer. To this end I grow small quantities of different varieties, some not normally available elsewhere and sometimes in minute quantities from only a couple of plants. As an English hop grower it is important to me that home brewers can enjoy freshly packed English grown hops. This is the reason I put a ‘use by date’ on all my hops, to keep in line with my own commitment, to only sell the current seasons hops policy.